The idea of combining fish and veggie production into an integrated system is far from new. Ancient precedents for integrated aquaculture include the chinampas of Mexico and the integrated rice paddy systems across parts of Asia. But how did we get from these sorts of ancient land-based systems all the way to backyard aquaponics? 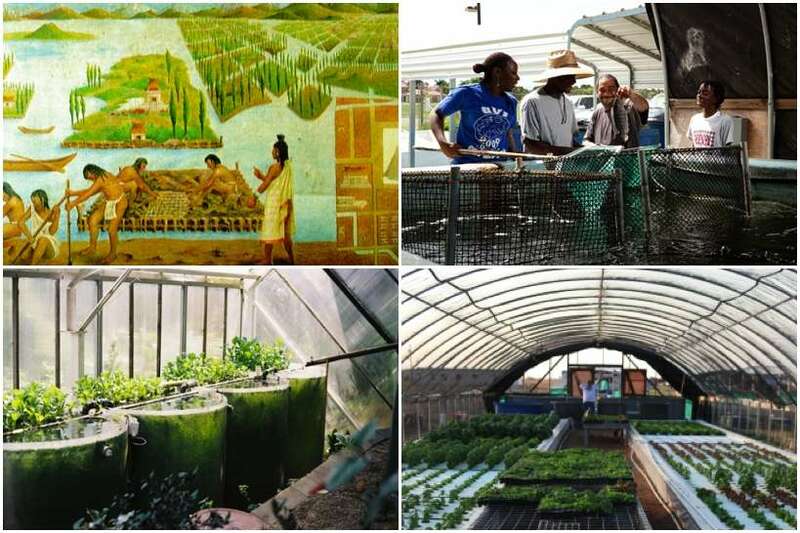 Aquaponics is a term that was coined in the 1970s, but the practice has ancient roots – although there is some debate on its first occurrence. The earliest example of one branch may be the lowland Maya, followed by the Aztecs, who raised plants on rafts on the surface of a lake in approximately 1,000 A.D. The Aztecs cultivated a system of agricultural islands known as chinampas in a system considered by some to be the first form of aquaponics for agricultural use. Chinampas are networks of canals and stationary artificial islands in which they cultivated crops on the islands using nutrient-rich mud and water from the canals. In the early chinampa systems, plants were raised on stationary (and sometime movable) islands in lake shallows. Nutrient-rich waste materials dredged from the Chinampa canals and the surrounding cities was then used to manually irrigate the plants above. The earliest example of another branch can be found in South China, Thailand, and Indonesia, where the cultivation and farmimg rice in paddy fields in combination with fish are cited as examples of early aquaponics systems. 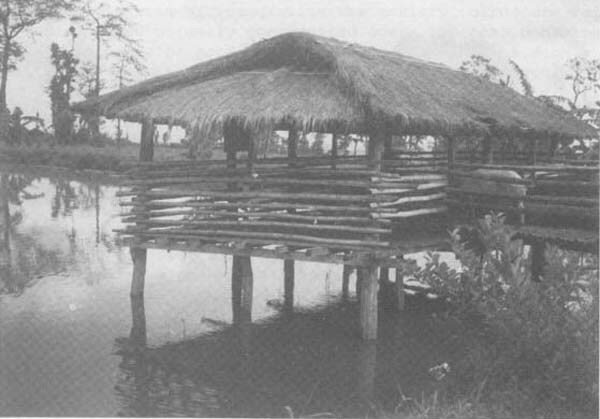 These polycultural farming systems existed in many Far Eastern countries and raised fish such as the oriental loach, swamp eel, Common and crucian carp as well as pond snails in the paddies. The ancient Chinese employed a system of integrated aquaculture in which finfish, catfish, ducks and plants co-existed in a symbiotic relationship. The ducks were housed in cages over the finfish ponds, and the finfish processed the wastes from the ducks. In a lower pond, the catfish live on the wastes that have flowed from the finfish pond. At the bottom of the system, the water from the catfish ponds was used for irrigated rice and vegetable crops. In a modern context, Aquaponics emerged from the aquaculture industry as fish farmers were exploring methods of raising fish while trying to decrease their dependence on the land, water and other resources. The advantage of RAS is that fish can be stocked much more densely, thus using only a fraction of the water and space to grow the same amount of fish as pond or netting based systems. The (rather large) disadvantage is the large amount of waste water that quickly accumulates and the antibiotics needed to keep the fish healthy, both of which impacts on the rest of the biosphere – both in RAS systems and also in netting based systems based in estuaries. 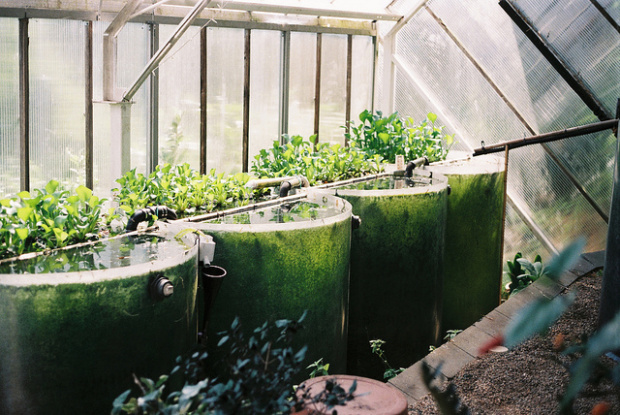 The term aquaponics is often attributed to the various works of the New Alchemy Institute and the works of Dr. Mark McMurtry at the North Carolina State University. In 1969, John and Nancy Todd and William McLarney founded the New Alchemy Institute. The culmination of their efforts was the construction of a prototype Bioshelter, the “Ark”. The Ark was a solar-powered, self-sufficient, bio-shelter designed to accommodate the year-round needs of a family of four using holistic methods to provide fish, vegetables and shelter. 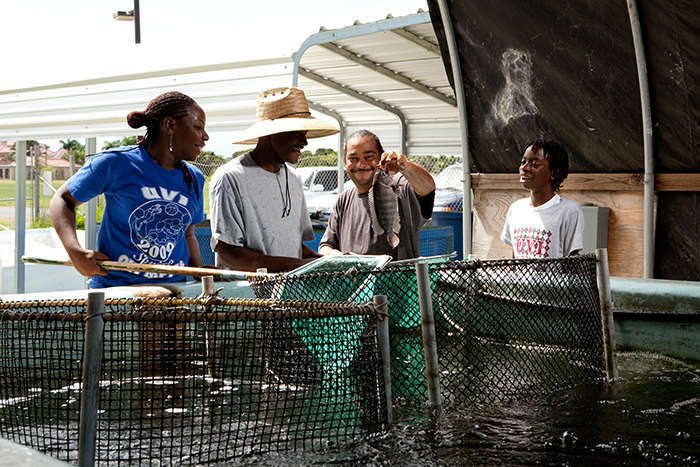 At the same times in the 1970s, research on using plants as a natural filter within fish farm systems began, most notably by Dr. James Rakocy at the University of the Virgin Islands. By 1997, Rakocy and his colleagues developed the use of deep water culture hydroponic grow beds in a large-scale aquaponics system. Meanwhile, in the mid 1980’s, Mark McMurtry and Professor Doug Sanders created the first known closed loop aquaponic system. In this system effluent from fish tanks was used to trickle-irrigate tomatoes and cucumbers in sand grow-beds which also functioned as bio-filters. As the water drained from the sand grow-beds it was recirculated back into the fish tanks. McMurtry’s research and findings confirmed much of the background science that underpins Aquaponics. It officially worked. 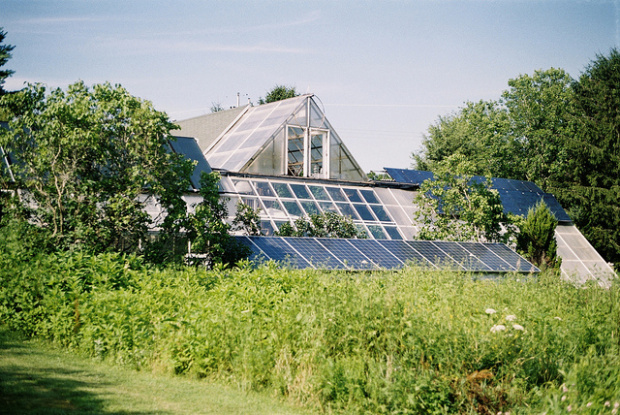 The first large scale commercial aquaponics facility, Bioshelters in Amherst, MA, was established in the mid 1980s, and it’s still in operation today. Then in the early 1990’s, Missouri farmers Tom and Paula Speraneo introduced their Bioponics concept. 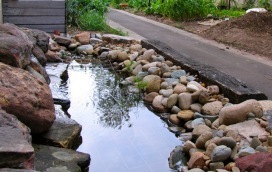 They grew herbs and vegetables in ebb and flow gravel grow beds irrigated by the nutrient rich water from a 2200 litre tank in which they raised Tilapia. While gravel grow beds had been used for decades by hydroponics growers, the Speraneos were the first to make effective use of them in Aquaponics – remembering prior to this, sand was the main growing medium used in emerging aquaponcs systems. Their system was practical and productive and has been widely duplicated. Home based aquaponics owes its origin to the Speraneos – they wrote a how-to manual that became a springboard for many home based systems built throughout the world. Meanwhile, Canada saw a rise in aquaponics setups throughout the 1990s, predominantly as commercial installations raising high-value crops such as trout and lettuce. In Australia, interest in aquaponics probably took off because it showed growers an effective way to solve both water restriction problems, and poor soil conditions challenges. Joel Malcom led the movement by starting a popular forum in 2006 (Backyard Aquaponics), writing a book on creating backyard aquaponics systems, and creating and selling aquaponics systems designed specifically for homeowners. Malcom currently runs a retail center (Backyard Aquaponics) in Perth and edits the Backyard Aquaponics magazine, which started in 2007. 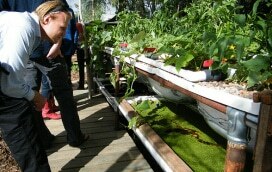 Then there’s Wilson Lennard – an Australian academic with practical commercial aquaponics experience and knowledge. Lennard’s PhD centred on optimizing the aquaponic process in terms of maximum plant growth and nutrient removal for the Australian Murray Cod fish species and the Green Oak lettuce variety. 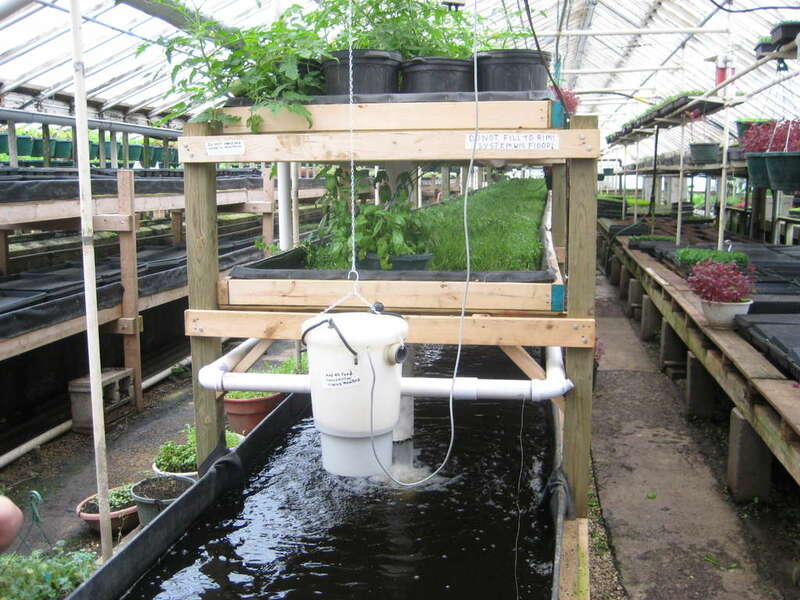 This was done by using a scientifically replicated experimental aquaponic system. Wilson proved that an optimal balance of fish to plants can be achieved, so that the same water may be used perpetually within the system. This means that, if you get it right, water is never removed from the system – making aquaponics potentially the most water efficient food growing technology that we have in the world today. In addition, aquaponics has the potential to have hugely lessened environmental impacts than other forms of fish production, primarily because of the absence of nutrient-rich waste-water discharges from the system. The Caribbean island of Barbados created an initiative to start aquaponics systems at home, with revenue generated by selling produce to tourists in an effort to reduce growing dependence on imported food. In Bangladesh, a team led by Professor Dr. M.A. 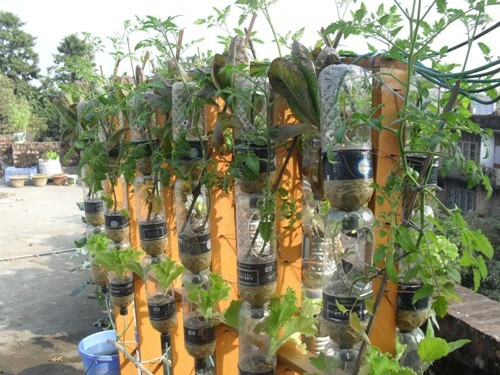 Salam at the Department of Aquaculture of Bangladesh Agricultural University, Mymensingh has created plans for a low-cost aquaponics system to provide chemical-free produce and fish. This initiative is focussed on people living in adverse climatic conditions such as the salinity-prone southern area and the flood-prone haor area in the eastern region. Dr. Salam’s work innovates a form of subsistence farming for micro-production goals at the community and personal levels. Firstly, there’s the nonprofit foundation Growing Power that offers Milwaukee youth job opportunities and training while growing food for their community. Growing Power has built a series of greenhouses that use aquaponic technology to raise 10,000+ lake perch and over a 1,000,000 pounds of produce every year. By using their own compost to heat the greenhouses, Growing Power runs year round, making them what might be the most productive year-round farm in the Midwest. The Plant, an urban farm and green business incubator in Chicago, has an aquaponics farm in thier basement, which is in the process of expanding. 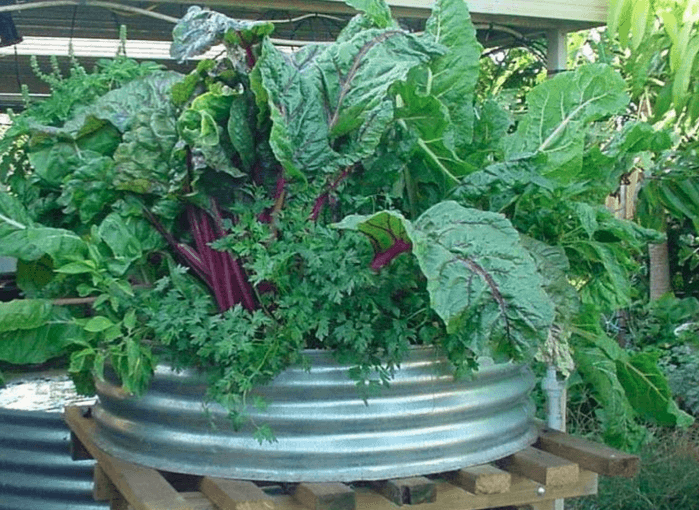 Backyard Aquaponics Workshops – based in Sydney, with us! Eat that which grows where you live, and mostly plants. That's pr . .
We've always been all about aquaponics in theory: a closed-loop s . . This is really interesting, especially that it can be used in urban farming. But if kept in a basement or wherever, do the fish suffer any health defects? Does it require any sort of light source to keep healthy? Might be a stupid question, but I just wondered considering that some animals can get vitamin D deficiencies etc and these fish are normally kept near the surface, where there is light. Wow – another very informative and timely blog post worth taking note of. We’ve been talking about experimenting with an aquaponics project here – I’m reblogging this in part so I can find it again! Tons of info and additional resources… Has anyone else had experience with projects like the ones described here? I’m also a big fan of Friendly Aquaponics out of Hawaii! My issue with Aquaponics is in the past (maybe this has changed?) the feed for the fish was fish pellets made from catching wild fish in the oceans causing terrible issues in itself. Unless the feed for the fish is coming from on site or via a sustainable method I can’t see how Aquaponics is a sustainable endeavour. Can you feed the fish with chicken or duck poop? And also, can I create these floating islands on my dam and grow veges there? Good article on how the relationship between plants and fish is an ancient one. Good read too on more modern setups and developments. Thanks for sharing with us a brief history on aquapolics. Until know, I knew very little about it and fobbed it off as being too hard to incorporate into my system. Why wouldn’t I give it a shot? The potential for backyard systems that utilize an aquaponic system inside a greenhouse is vast. Thermal mass to store heat, and it’s full of fish you can eat! This is really an eye-opener. I always thought aquaponics existed only a few years ago. It seems the we still have something to learn from the Aztecs!